365 Swims is a diary, a blog, a reminiscence, a challenge, a lark. Beginning on 1 June, the official start of the Australian winter 2012, 365 Swims will record a year of swimming. Not indoors in a heated pool. Not in some fancy private lap pool. At a beach. A calm, safe beach, admittedly. Most of the swimming will be in Williamstown, a bayside suburb in Victoria, Australia. That’s in southern Australia, where the winter’s can get chilly (but not icy or snowy). 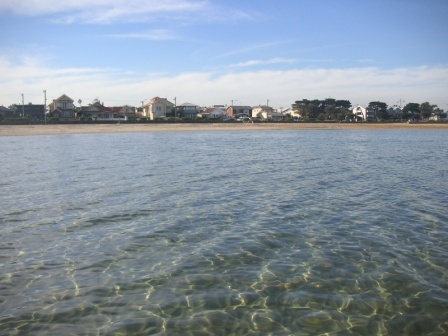 Some of the swimming, in the warmer months, will be snorkelling, in Jawbone Reserve, a marine sanctuary just around the corner from the main Williamstown beach. Postscript: since completing the weekly 365 Swims diary in mid-2013, this blog has become an occasional blog, often with poems and photos by fellow Willy swimmers.